When you get started with Walden, you work with your enrollment advisor to process your application and complete the initial admission process and through your first few days in your program at Walden. To support you through the rest of your program, you will also have a Student Success Advisor. About 6 weeks before your first day of class, your Student Success Advisor will begin to contact students who are admitted to discuss any questions about starting a program and life as a student at Walden. You will still continue to work with your enrollment advisor in the weeks prior to the start of class, making sure all required paperwork has been submitted to start your program and answering any questions you might have about your start date. Should you need to change your start date, for whatever reason, you should contact your enrollment advisor before the start of class to make sure that the change can be done in a timely manner and to see if there are any ramifications on your program related to the start change. Typically, after the first week of your first course you will transition to working with your Student Success Advisor full-time for program-related questions. At this time, you should direct any questions about your program to your Student Success Advisor. 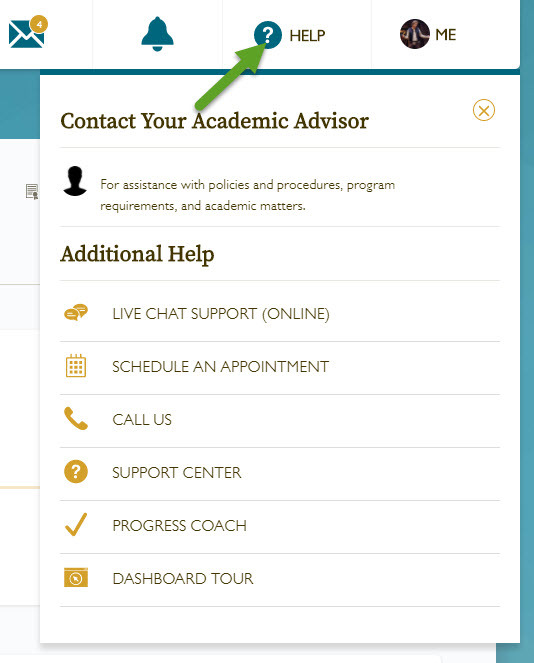 Your myWalden portal will identify who your assigned Student Success Advisor in the Help tab (see example below), but you can also work with another member of the advising team should your assigned advisor be unavailable at the time of your call or email.